Gasa the northern most district of the country adjoins the districts of Punakha, Thimphu and Wangdue Phodrang and with Tibet to its north. This starkly beautiful region with elevations ranging from 1500 to 4,500 metres experiences extremely long and hard winters and short but beautiful summers. It has the smallest population with just about 3000 inhabitants. Of culture meet the people of Laya, the nomads of western Bhutan. These people live on yaks and harvest of Cordycep (fungi of high value, used in oriental medicine). Locally known as the Tashi Thongmon Dzong, the fortress served as a defending barrack in the 17th century. It was named after the region’s protecting deity Tashi Thongmon. The fortress is unique with a circular shape and three watch towers that are placed at strategic points. 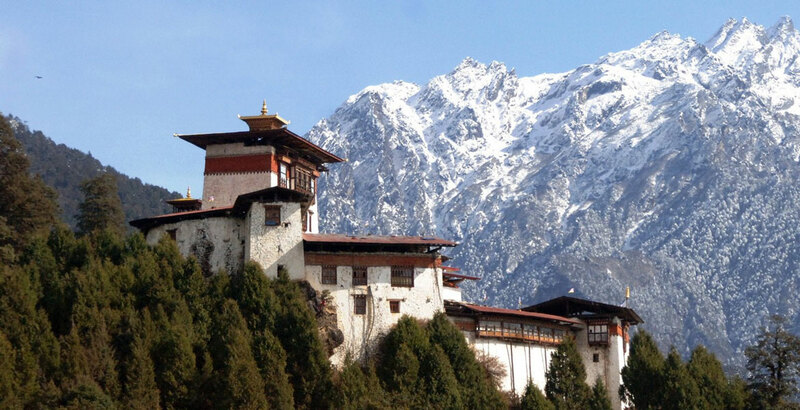 The beauty of the dzong is heightened during clear days with view of Mt. Gangboom. Time your trip there during the annual autumn festival. Let your adventurous spirit take you on a three nights trek to Laya. Situated at an altitude of 3800m, this village will mesmerise you with their unique culture. It is amazing how a small pocket of ethnic group survived for so long in the north of this small country. Anyone on the Snow Leopard trek or the grand Snowman Trek will converge through Laya. To experience the maximum cultural richness, why not time during their Owlay festival. This festival happens once in three years and the other festival you can bank on is the Takin Festival. The valley of Lunana is the most remote of Gasa district. To see Lunana is to experience the culture of Himalayan people residing amongst the glaciers. The people here make their living from yaks and sheep. The nomads here know a lot on medicinal herbs and have benefited a lot from cordycep harvesting. This wonder worm (Cordyceps sinensis) has given the nomads an extra income which will eventually lead to preservation of this nomadic culture. Zabsel and Phulukha choetens, Throe Lhakhang, Dung Goemba, Drophel Choling, Yonzho Lhakhang, Jangchub Choling, Bumpa lhakhang, and the ruins of the ancestral home of the 1st Deb Raja of Bhutan, Tenzin Drugyel. Gasa is famed for its numerous hot springs or Tshachus with renowned medicinal properties. The hot springs at the base of the Mochu river draws not just the locals but as well as Bhutanese from other parts of the country and tourists. Taking a hot dip in the Tshachus will be not just a wonderful experience but give you a healing experience. The natural splendour of Gasa is unparalleled in the country. It has some of the highest peaks arrayed like a saw along the natural border with Tibet. Over a hundred glacial lakes are at the foot of these mountains that feed the two major rivers in the country. The entire district falls under the Jigme Dorji Wangchuck National Park that has some rare flora and fauna species. One cn come across the elusive snow leopard, Takin – the national animal, Red Panda, the mountain goats, Blue sheep and the Blue Poppy, the national flower of the country. Each year a number of tourists pass through the region along its popular trails including the famous Snowman, one of the most arduous treks in the world.